John Fedchock is mostly known for his big band work in NYC where he has been holding concerts and releasing albums for some 20 years now. Despite his success with the large ensembles, John also likes to work with combos in small clubs as it allows the musicians to stretch out and take chances that can’t happen in more heavily arranged ensembles. In Fedchock’s own words, “playing in small club setting allows the players more of a chance to interact and create an intimate conversation through improvisation.” With the 2015 release of his critically acclaimed Fluidity CD, you are set to be thrilled with his recent release of Reminiscence; both recorded at the Havana Nights Nightclub in Virginia Beach, Virginia. 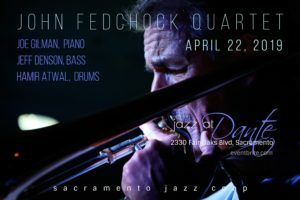 The Sacramento Jazz Coop is pleased to present the John Fedchock Quartet as he makes his West Coast tour, with Joe Gilman on piano, Jeff Denson on bass, and Hamir Atwal on drums. Trust us when we say, you will not want to miss this performance.